Unbleached flour is refined flour that has not had any whitening agents added to it. Bleached flour is flour that has been whitened – i.e. bleached – using chemicals. 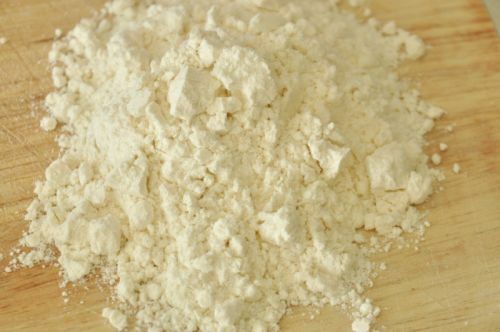 Bleaching flour does not have much of an impact on the flavor of the flour, although some people say that they can taste the difference, so if you are very sensitive you may fall into this category, but it does change the color of the flour to a bright white. Bleaching also serves to lower the protein content of the flour, softening it so that baked goods made with it will be more tender. Most cake flours, for instance, are bleached. Unbleached flour has a pale off-white color and the difference between it and bleached flour is very clear when you put the two side by side. Unbleached all purpose flour is widely available and is a good choice for just about all baking projects, regardless of whether the recipe specifically calls for unbleached flour. In fact, a good number of bakers these days use unbleached all purpose flour exclusively (using only bleached cake flour in recipes that specifically call for it), so many recipes are designed with it in mind. Baked goods made with bleached flour may have a slightly softer texture and a brighter color than those made with unbleached flour. You’re probably not going to notice a significant difference in a batch of chocolate chip cookies made with unbleached vs bleached flour, but you may notice that your angel food cake is lighter, whiter and softer when made with flour that has been bleached because the difference is much more obvious in that type of baked good. Recipes using unbleached Flour see Here and Here.